Anxious for The Amazing Spider-Man to be out in stores? If so, I have something amazing to share with you! 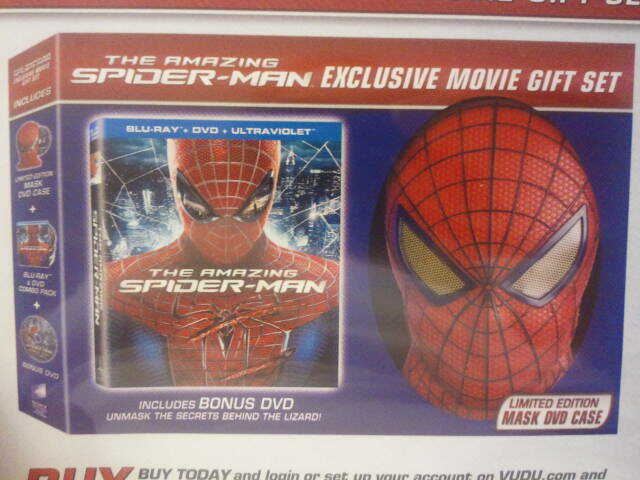 You can pre-purchase a gift set with an exclusive Blu-ray, DVD movie, and a limited edition mask DVD case. You also get a virtual copy of the movie before it is out and get a sneak peek at never-seen-before stunt footage and deleted scenes! Jacob and I headed to Walmart in search of the pre-purchase case. 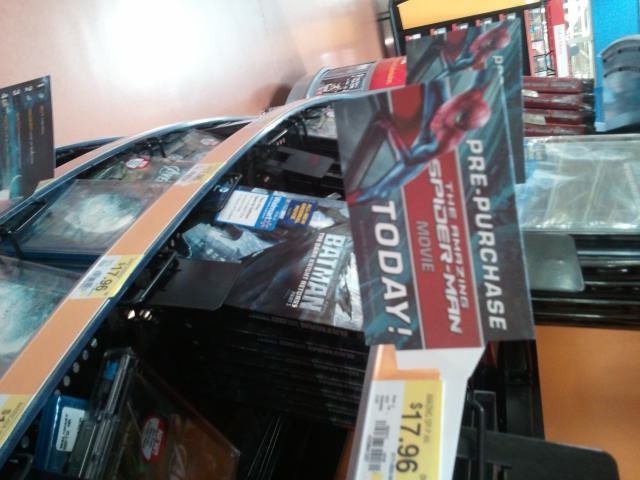 When we headed back to the entertainment section we saw the signs that said to pre-purchase The Amazing Spider-Man TODAY! The only problem was that there were not any movies on the shelf and when I inquired I was told the store didn’t have any in yet. They called around to other stores nearby for me and found one that had the movies in stock so I headed over to that Walmart. 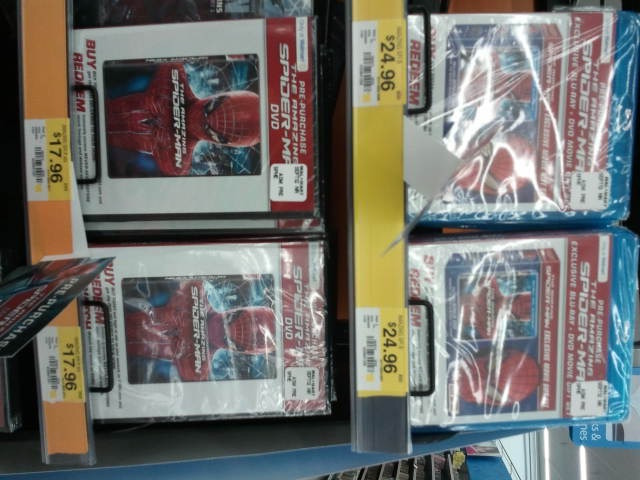 This location had many copies of both the DVD by itself and the combo pack that I was looking for. Once I bought it I headed home to see what was in the case. The cardboard disc inside the case told me everything I needed to know about the process of pre-purchasing a movie with vudu.com. 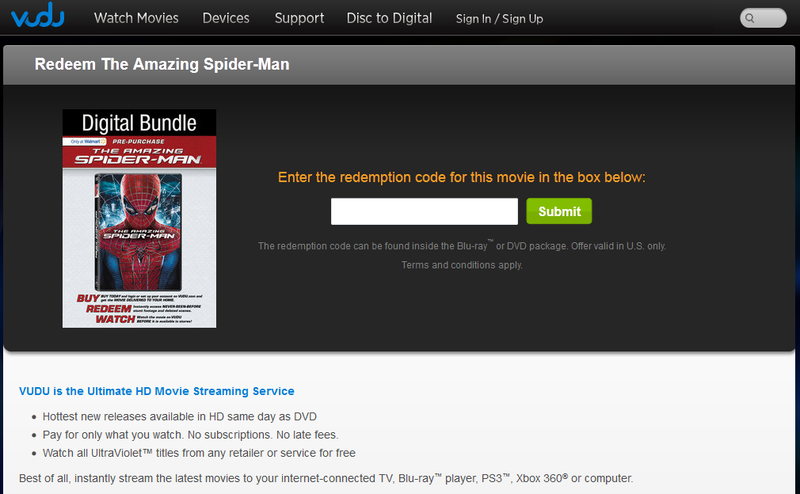 The first step was to go to The Amazing Spider-Man page on VUDU’s website and enter my redemption code. Since I was new to VUDU.com I was asked to sign up for a free account. I liked the idea of having a hard copy of the movie but also having a digital one. Once I filled out a short form I was a member of VUDU.com and received a free movie to start off my collection. 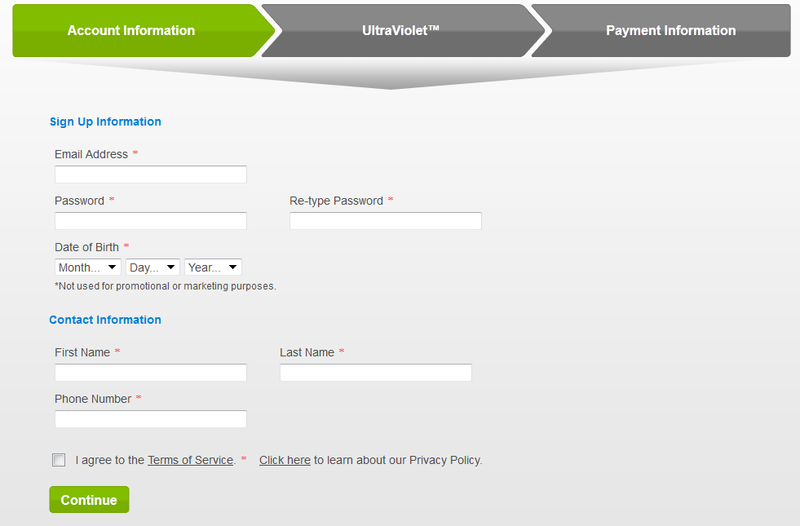 I also had an opportunity to sign up for UltraViolet at the same time. According to their website, “UltraViolet is a free, online digital rights collection that gives you greater flexibility with how and where you watch the movies and TV shows that you purchase. When you buy a movie or TV show from a participating retailer, it’s automatically added to your UltraViolet Collection and you have options to stream it over the Internet, download it for offline viewing, or get a physical copy such as a DVD.” I got a free movie for signing up for UltraViolet as well. The last form to fill out was an address form so I could receive my DVD, Blu-ray, and mask DVD case in the mail. 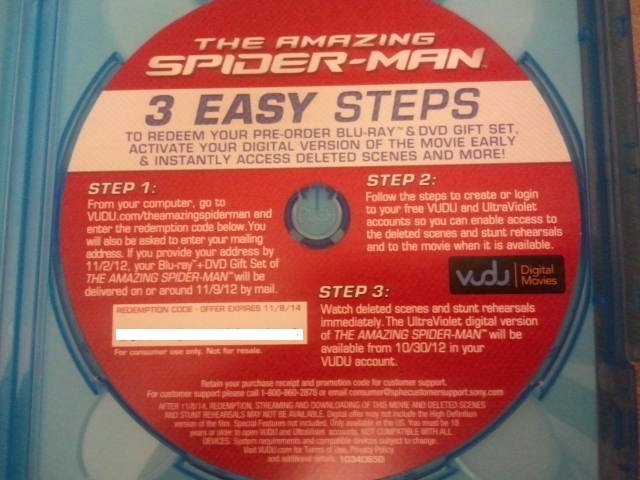 The Amazing Spider-Man comes out on DVD November 9th but since I redeemed my code early I will be able to view it online October 30th and have a hard copy sent to me a couple days before the “official” release date! 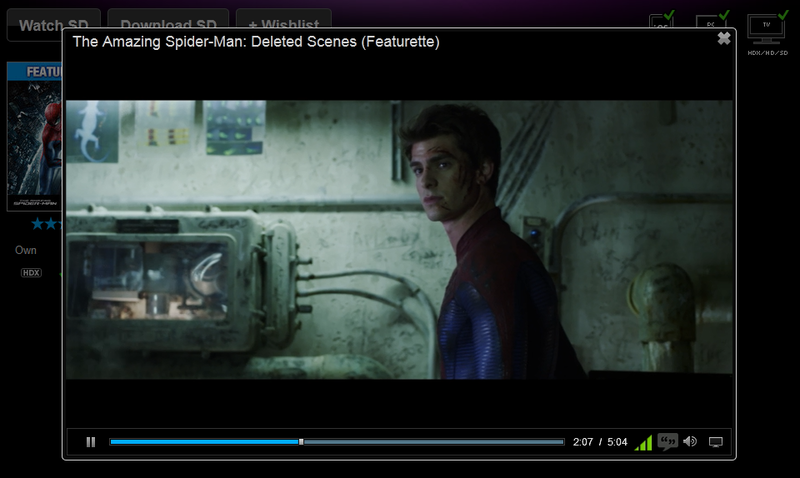 While I wait I can watch bonus content on my VUDU.com account. I had the option to watch deleted scenes and stunt rehearsals. Since I didn’t get a chance to see this movie in theaters I wanted to watch these and now I am looking forward to the movie even more! The movie looks amazing! I am so happy that I pre-purchased it so I only have less than a month to wait before I can watch it. My family is excited too because they love Spider-man! Look out for a Spider-man themed party post in November because I am going to be celebrating the release of the movie with some fun spider themed treats and party decor! I didn’t get to see it in theaters either. I can’t wait! I missed it in theaters too so I’m glad things to come to DVD quickly these days!